We loved Bath from the moment we arrived. The weather was awful (I think we only had 2 rain-free hours in the few days we were there! ), but the city’s charm had us wanting to explore as much as possible. 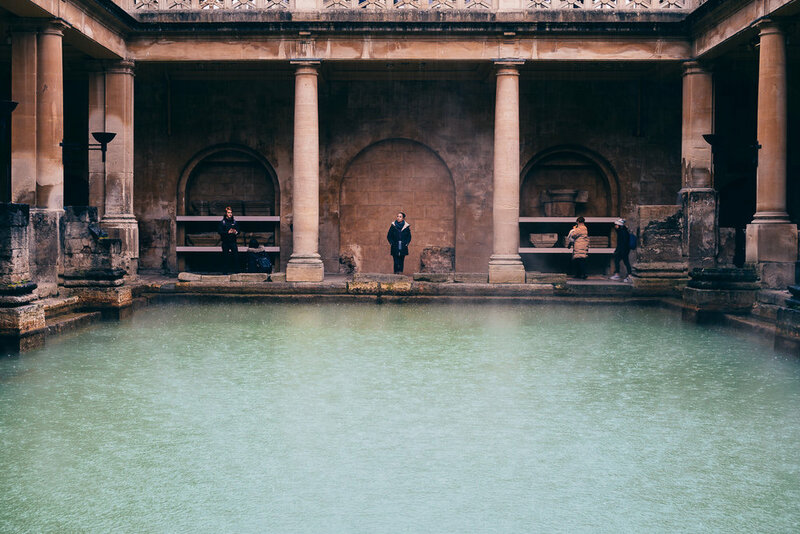 Here is how we suggest spending 2 days in Bath — rain or shine. The Roman Baths are smack dab in the middle of the city, with an impressive history of about 2,000 years. Their construction started in 60-70 BD, and then took a couple of hundred years for it to be finished. Since then, it's had many renovations over the centuries but the essence has remained the same. Alongside the captivating pools, you'll also find a museum that provides a view of the history of this place in a very entertaining (yet didactic) way. Then at the the end, you’ll be offered a free cup of the treated natural water to drink! It’s a cool experience — but just so that you know — the taste of the water is kind of funny (to say the least). The actual Baths were closed to the public in the 1970’s for safety reasons, but if you want to experience to a swim in these waters now, all you have to do is visit the Thermae Bath Spa, which uses the same waters but has them treated. (We've got this planned for you in itinerary day 2!). 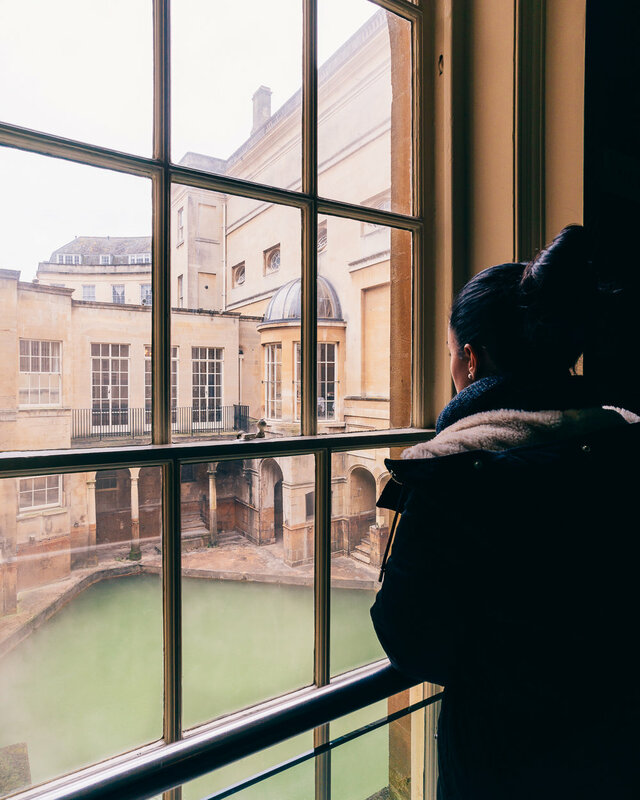 The price is £16.50, but if you get the pass to the Roman Baths, Victoria Art Gallery, and Fashion Museum, you get a special price of £22.50 for all three! 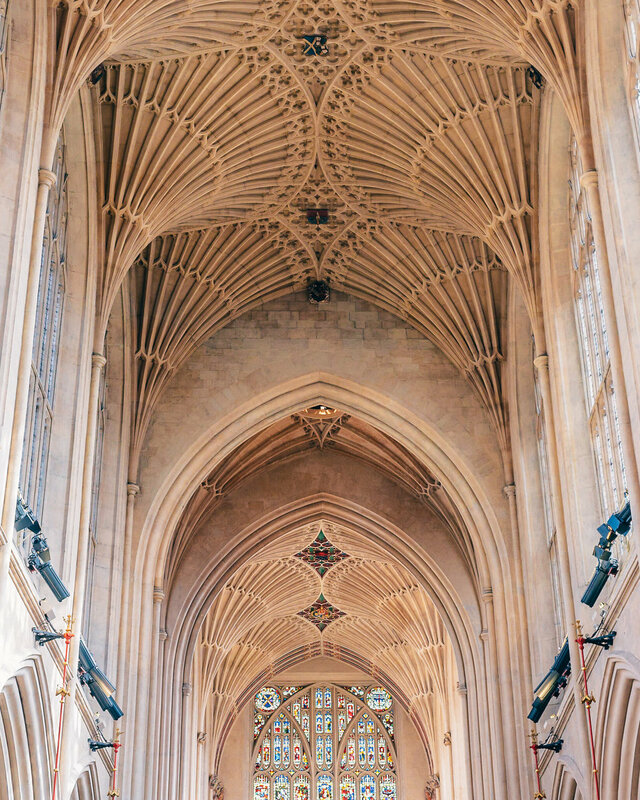 Just next to the Roman Baths, there is the magnificent piece of art known as the Bath Abbey. This Gothic building dates back to the 10th century and is absolutely stunning. The entrance is completely free, with the option for you to leave a donation if you'd like. The hours of operation that you can expect are: 10:00 am to 4:30 pm, and up to 5:30 pm during the summer. This is a beautiful contemporary art museum located next to the Avon River. It has a permanent collection on the second floor, with pieces of art that are over 500 years old! And while there's a small fee to get into the temporary exposition (pictured below), access to the second floor is absolutely free. The Victoria Art Gallery is open from 10:30 am to 5:00 pm. Have a stroll through the Pulteney before going to lunch (pictured below at sunset)! This unique bridge overlooks the Avon river and is characterized for its Georgian architecture. Plus, you'll find quaint stores and cafes on both sides of the bridge that you're free to explore if you wish. This tradition shouldn't be missed no matter what part of England you're visiting! In Bath, you have tons of options to choose from to find the perfect tea salon. Tea time is normally served between 1pm and 5pm, but it varies on the region you visit and the restaurants within it. We went to the "Bath Bun," mostly because we liked the quirky look of the salon. In the end, it wasn’t at all bad, but it wasn't our favorite of all the tea salons we've been to (especially considering those outside of Bath). Here are a few more ideas (ext. link) on where you could go. The Royal Crescent is a series of 30 Georgian-architecture buildings from the 18th century that were built in a crescent form. You'll be able to get a great photo of these iconic buildings from the gardens of the Royal Victoria Park that can be found right in front of the Royal Crescent! Also worth mentioning is that inside Royal Victoria Park there is a Botanical Garden. Although we didn’t visit them due to the intense rain that wouldn't let up while we were in Bath, this place is perfect to visit after the Royal Crescent. The Botanical Garden is connected just through Victoria park, making it a 10-minute walk away. 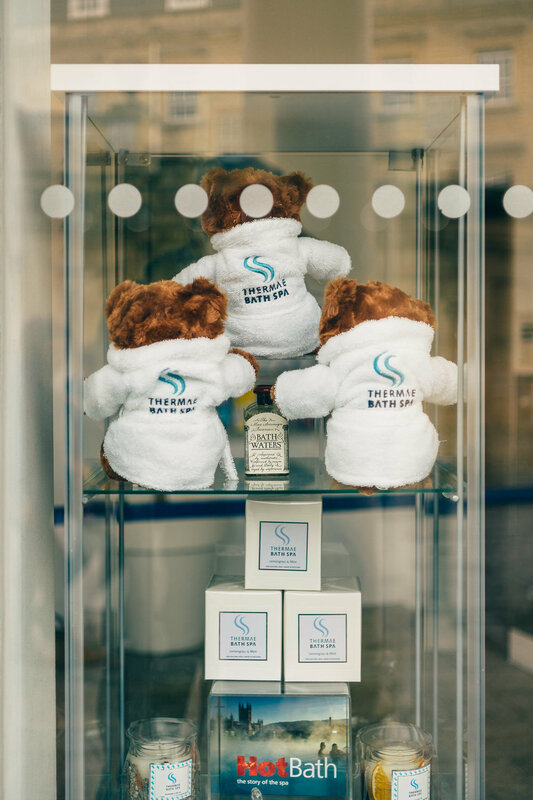 The highlight of our Bath visit was spending a couple of hours at this amazing spa, located in the heart of Bath. The spa spans throughout several floors, with an stunning pool on the rooftop of the building that is absolutely perfect early in the morning when the spa is still practically empty (pictured below)! One of the floors — our favorite — is known as the wellness suite. This suite has a combination of different experiences, all themed appropriately, such as a "Georgian Steam Room," an "Infrared Room" and a "Celestial Relaxation Room," among others. At the bottom of it all there is another big pool with massage jets, a massive whirlpool and a lazy river to float through. And at the end of your visit, don’t forget to visit their cafe so that you can cap your relaxing experience off with a lovely drink or meal accompanied by views of the city. The best time to visit is right when the spa opens, first thing in the morning. Afterwards, the spa quickly starts to fill with people and lines to get inside begin to grow. The spa is more than large enough for the droves of people that visit it daily, but it is a much more intimate and relaxing experience if you can visit earlier on. One last note: Although this activity is a little pricier than what our budget normally allows for, investing in one's wellness, body, and mind is something that's always worth it! 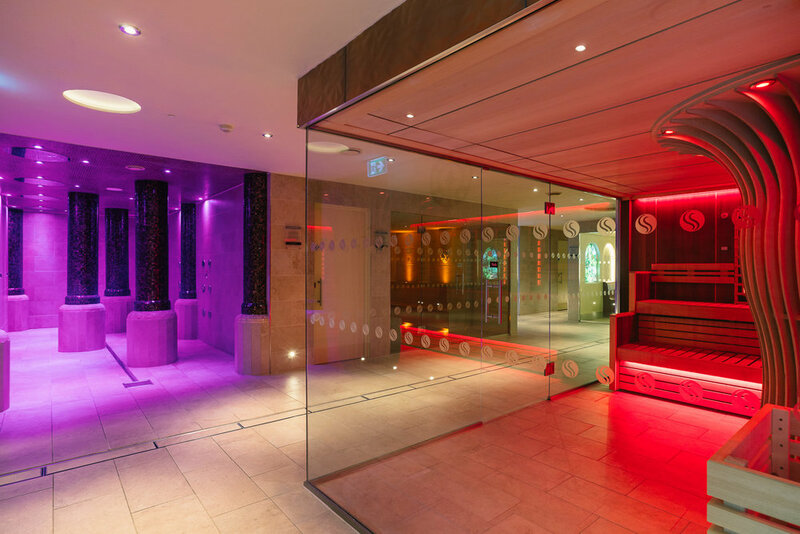 The cost here is £36 if you visit on a weekday, and the Thermae Bath Spa is open from 9:00 am to 9:30 pm. Have you ever seen a glass-blowing exhibition? In Bath, you have the opportunity to visit Bath Aqua glass, a glass blowing studio that will show you the up-close-and-personal view of how these beautiful and ornate pieces of glass are made — from vases to animal figurines to jewelry. 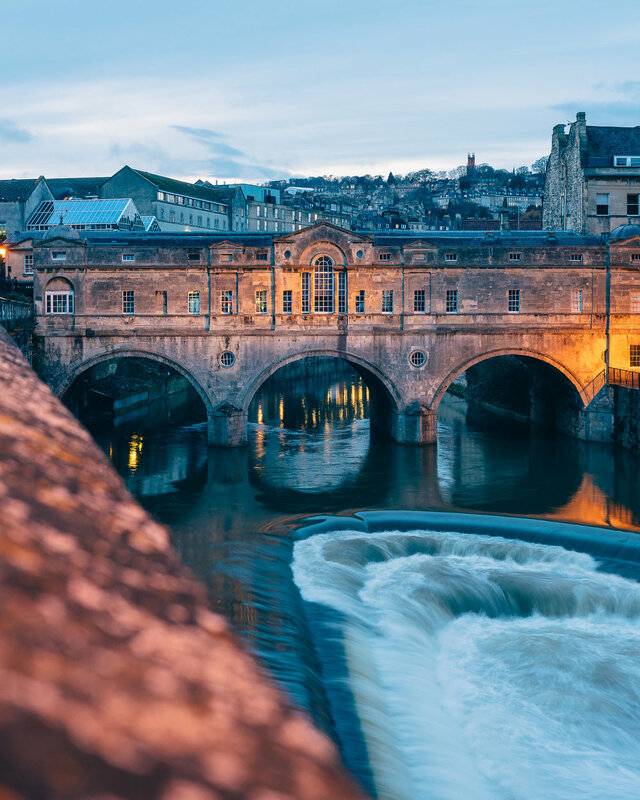 A small souvenir from this place makes for an original and unique gift to bring back home to your loved ones, while simultaneously supporting the local economy in Bath. The price here to watch the live presentation is just £4.5, and hours of operation are 9:30 am to 5:00 pm. The best place to try the famous Bath buns is to visit the oldest house in Bath: Sally Lunns. In here you'll find a tea room and a small museum downstairs that is a recreation of Sally Lunns's original kitchen, where you can now buy these delicious semi-sweet buns. Something to keep in mind is, buying them to-go is cheaper than eating there, so take a few of these with you, and don't forget to get some jam/jelly! The city sightseeing bus tour is perfect for seeing lots in a short period of time, especially if the weather isn't in your favor. In Bath, they offer 2 distinct routes: one that goes around the city center, and the other that takes you to the area surrounding Bath. They also make for great transportation, as you can hop on and hop off while you visit other attractions in the city! Your ticket is valid for 24 hours and you can get on as many times as you want at any one of their stops. The pick-up point is next to the Abbey for the city center tour, while the other stop is in front of the tourist information point. We visited the Holburne Museum off of one of the city sightseeing bus stops. This museum contains the collection of art that all belonged to Sir William Holburne, the fifth baronet of Menstrie. Although we didn't visit Sydney Gardens because of the rain, these gardens are just around the Holburne Museum and from what several locals described, it's a beautiful place for walking around for a couple of hours and isn't very touristy. There's also a cafe at the bottom of the museum where you can relax, eat, or just have a cup of coffee. 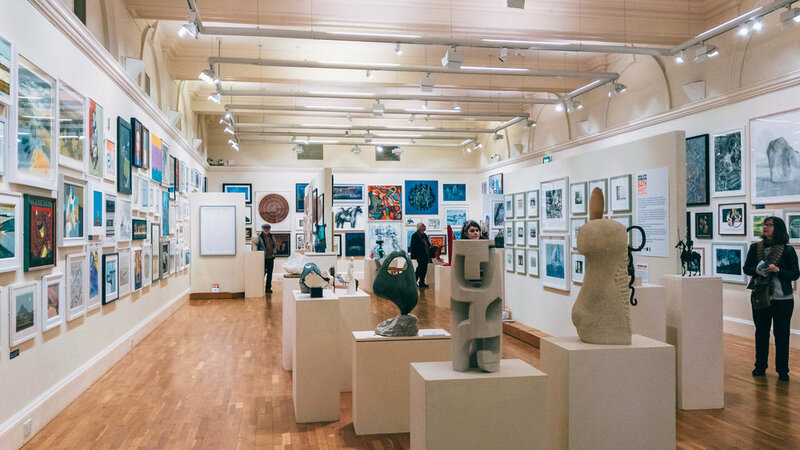 *As an alternative to the Holburne Museum, we also heard plenty about the Fashion Museum Bath, where you can find many different expositions, like dresses from the Royal women for example. As many of you may have already seen from our prior England articles (London and Newquay! 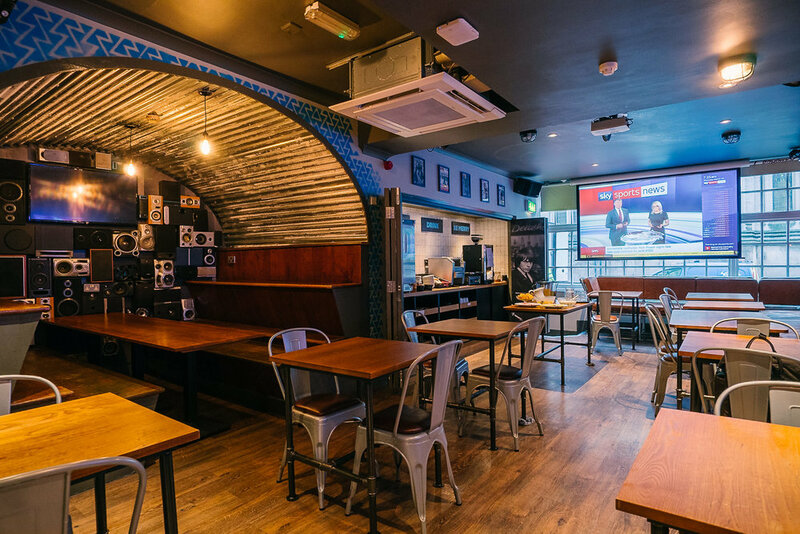 ), St. Christopher's Inn Hostels has been our go-to accommodation whenever possible. 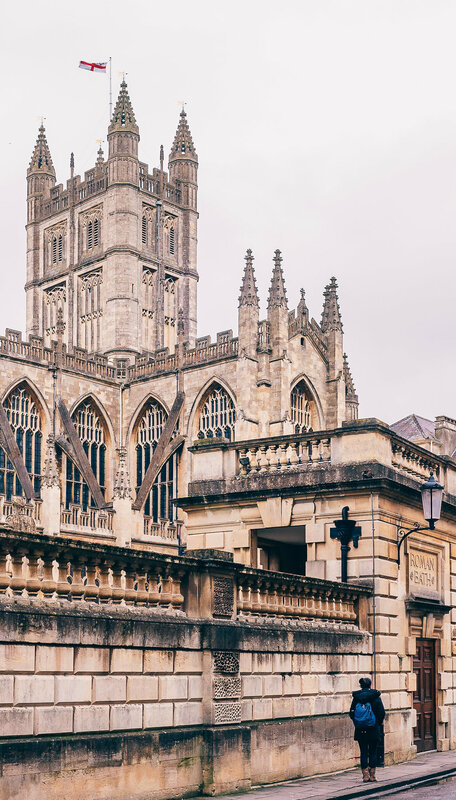 We loved the one in Bath, particularly because of its strategic location: it's only a 5-minute walk from the Bath Abbey, which makes it incredibly easy to walk to just about any part of the city. Then of course, we'd be remiss not to mention the free breakfast that's always included — this is always a big component for us and our budgeting! 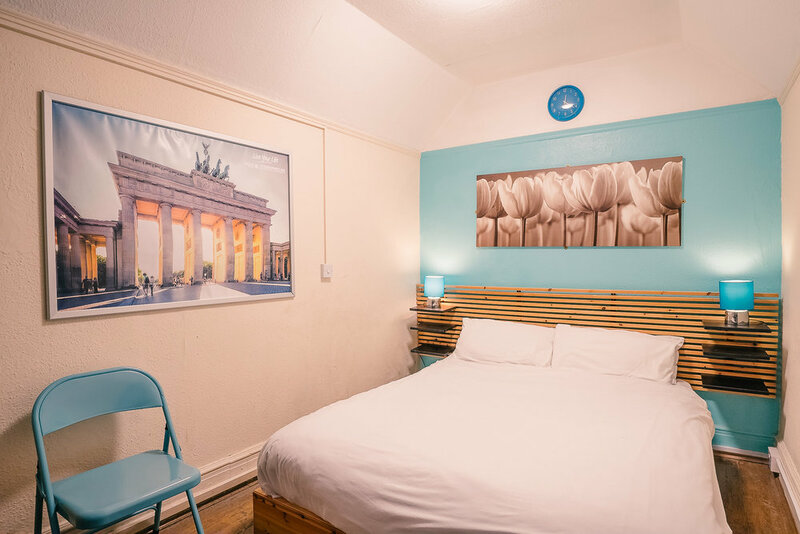 Lastly, remember that all of St. Christopher's Inn hostels also have private rooms available, so if you’re the type that prefers privacy, this is still a great option for you!